Plastic window insulation film is available in kits. They make great temporary interior storm windows, significantly reducing fall and winter time heat loss. The 3M company was the first to introduce these insulated window coverings to home energy savings minded consumers. Since then 3M window insulation has become somewhat synonymous with temporary inside storm window kits. But today there are several reputable companies that offer these window coverings. Do it yourself interior storm window kits are ideal for both homeowners and renters. A plastic window insulation kit can cost as little as $9 to $20, depending on the size of the kit and the manufacturer. Within most kits is enough insulating film to cover 5 to 6 standard size windows, or 2 large size windows. Installing plastic window insulation film is very easy and only takes a few minutes. The tools needed are scissors, double sided tape and a hair dryer. Once cut to fit and properly secured, the hair dryer is used to tighten and shrink the film. This drum tight fit provides an insulating seal between the window pane and the interior of the home. Just like with permanent interior storm windows, window insulation film is transparent and undetectable from the outside. Other window treatments such as external window shutters, significantly alter the outside appearance of a home. 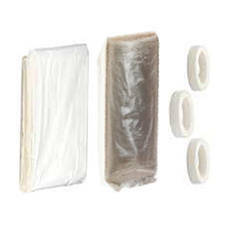 There are some window insulation kits that can be reused. These kits usually come with self sticking mounting clips that are designed to stay on the interior window trim all year long. The sealing plastic film is merely removed from the mounting clip and can be stored and reused seasonally. However most of the mounting clips have to be purchased to size. And several kits may be needed in order to have enough mounting clip material to fit around a large window unit. Installing these interior storm windows will obviously make opening the window impossible. But for those who live in colder climate regions this may not be an inconvenience at all. The insulating plastic used is quite durable. However they can be repositioned and punctured by children and pets. These energy saving window treatments are only moderately effective at reducing solar heat gain, for the spring and summer months there are several other much more effective solar window coverings.